Having a fire sprinkler system in your commercial building is essential for everyone’s safety. Fire sprinklers are something we typically take for granted. But, there was a time when not all commercial buildings were required to install fire sprinkler systems. Not until the 1970’s were businesses required to have fire sprinkler systems installed in their facilities. However, these days, the result is that many business owners struggle with the lack of fire sprinkler systems in their buildings if the building was built before the 1970’s. This can lead to some catastrophic results. The result is that business owners need to get their systems retrofitted with new fire sprinkler systems to allow for optimal protection in case a fire breaks out. When it comes to the world of fire protection, tremendous advances are being made every day. An important thing for all business owners to consider is how safe and protected their facility is from a fire. Now, technological advancements have been made that allows for business owners to equip their buildings with high-tech fire sprinkler systems. More flexible piping systems allow for more water to be brought into buildings. With new pipes, your business can benefit from a system that provides you with a seamless retrofitting process. According to the National Fire Protection Association, the damage from a fire can cost anywhere from forty percent (40%) to seventy percent (70%) less than a building with working fire sprinkler systems. This doesn’t even factor in the incalculable cost of potential lives that could be harmed in a fire. Many incredible benefits come with a fire sprinkler system. 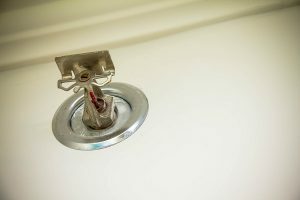 One that is often overlooked is the reduction of water pollution that comes with a fire sprinkler system. The amount of water pollution that is put out when fighting a fire is significantly lowered when an efficient system is installed. In fact, older buildings that require retrofitting a fire sprinkler system will usually see a significant reduction in their insurance premiums once all the inspections are conducted. This entry was posted on Wednesday, November 29th, 2017 at 2:41 pm. Both comments and pings are currently closed.